If "whatever can go wrong, will," then I think it is also true that whatever goes right will be under-appreciated. I also think that "whatever can go wrong, will" implies that more stuff goes wrong than goes right. Right? Does more stuff really go wrong than right? -- or, does it just seem that way because our demands on "rightness" are a little unreasonable? All of this stuff is connected, I think. We want many things -- maybe too many things -- out of life and when we don't get them, we feel conspired against by the fairies or by God or by the machinations of Fate. Sadly, for some -- and at some times, for all of us -- it is true it rains problems and people find themselves existentially adrift. We can't deny that. But, all things being normal, most of us lead lives on pretty solid, dry ground. 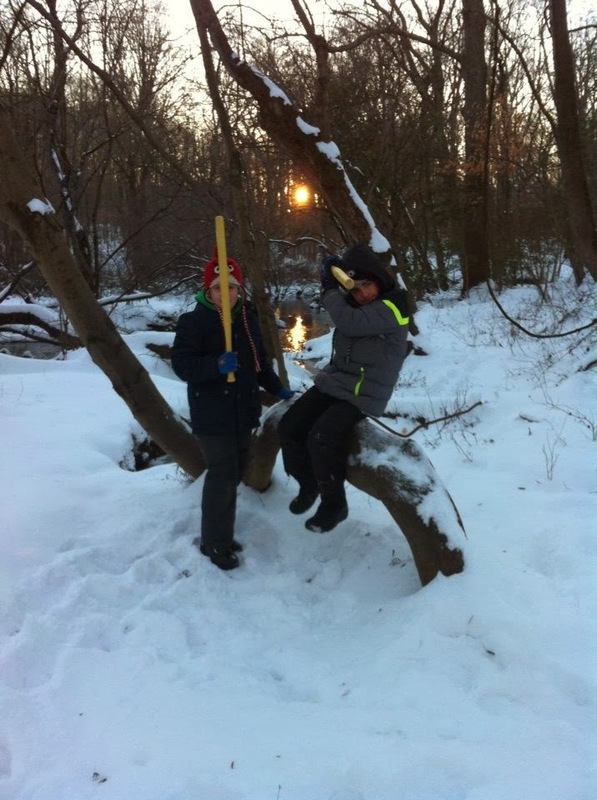 In the woods, on a "snow day"
"Appreciate what you have" is another popular mantra, whether from a religious or a from secular spiritual perspective. It is good advice, really, and it implies the need to thank some higher power for all that is good. But I would bet that the "whatever can go wrong will” perspective comes from the failure to do that on a small scale; not to the lofty level of saying “dear God, thank you for keeping my baby healthy” but from breezing past the many small, fortunate occurrences in our lives. In short, whatever can go right, will, but it will be under-noticed and soon forgotten about. The bad air sticks in our lungs like cigarette tar, but the bad things are breathed in and exhaled to dissipate and to mingle with those iconic molecules of Caesar’s last breath up in the ether. Now, our employees and students get automated calls, but, up to only a few years ago, since our school is so small, the office staff used to call assigned groups. I used to get my call from our grandmotherly financial secretary who would just say: “Chris, go back to sleep...” I would profess my deep, passionate love for her and just hang up and roll over. Then, rash youth that I was, I would wake up and continue with my day. But I would skip basking in my small good fortune. What went right went under-appreciated. Today, I got the welcomed, but chilly voice of the automated woman. But, today, I dove back under the sheets, gave my wife a pat on the shoulder and received one in return and stopped to absorb the good fortune of the day. My dog jumped up with her front half on the bed and I put my arm around her as her furry head settled on my shoulder, and I drifted back off, thinking thankful thoughts...for once, inhaling a magic kind of oxygen that never turns to carbon dioxide, as long as you refuse to let it; a breath one never needs to let go. I will do this more. And when I do, I think whatever can go right, will. Or, at least, it will seem so. And, in the end, seeming is everything.